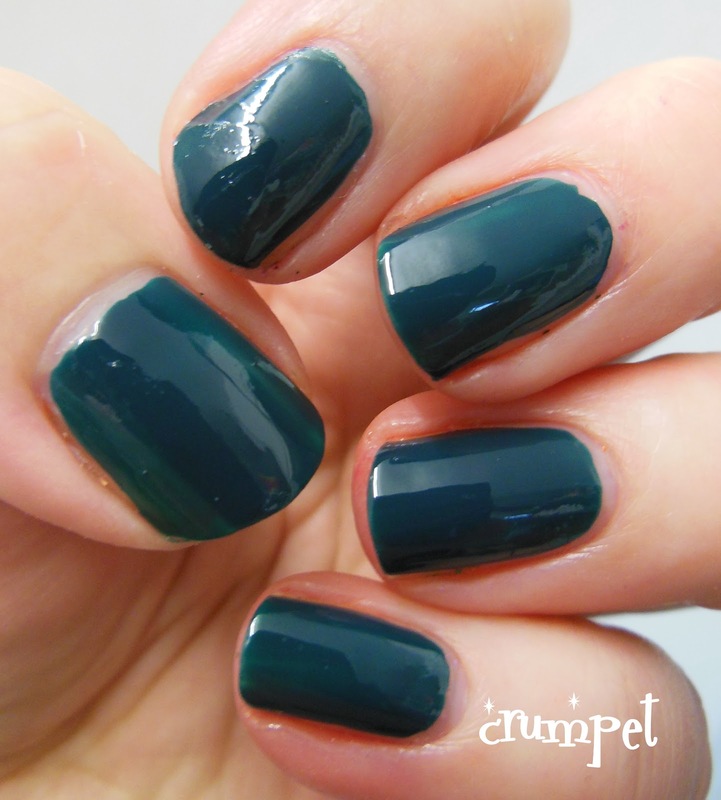 Those of you who read this blog regularly will know of my love / hate relationship with green. 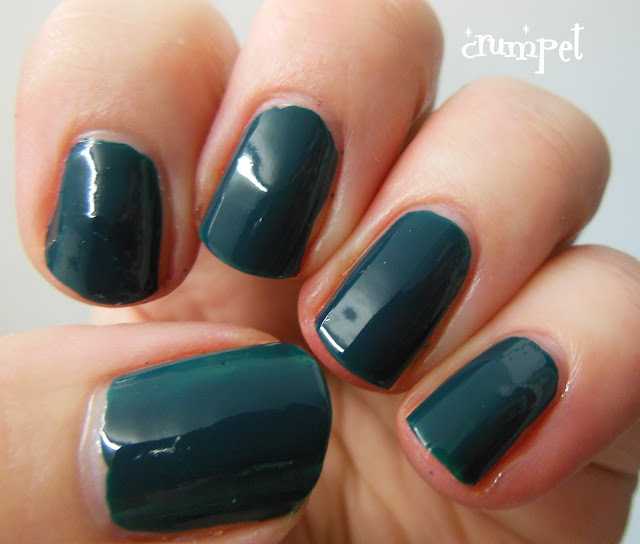 Green is one of my very favourite colours in life, but just not one that I can often successfully wear on my nails. 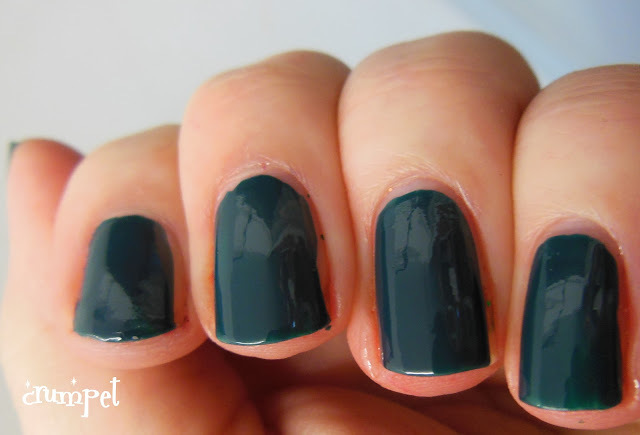 So on paper, today's mani should be a living hell, but it's a surprising winner in many ways. Let's start at the Barry end first. When I bought the Gellies, I was confident Watermelon would end up being a gift or a swap, but I am surprisingly entranced by it. It's pretty much as dark as green can go and yet still retain its greeny glory. The Gelly-ness of it makes it all the more gorgeous. Dark and shiny, it looks fabulous. It's also the most opaque of all the Gellies, and is a genuine 1 coater. For anyone who loves green, I imagine this is going to quickly become a must have. I've paired it with a green Shimmer polish. 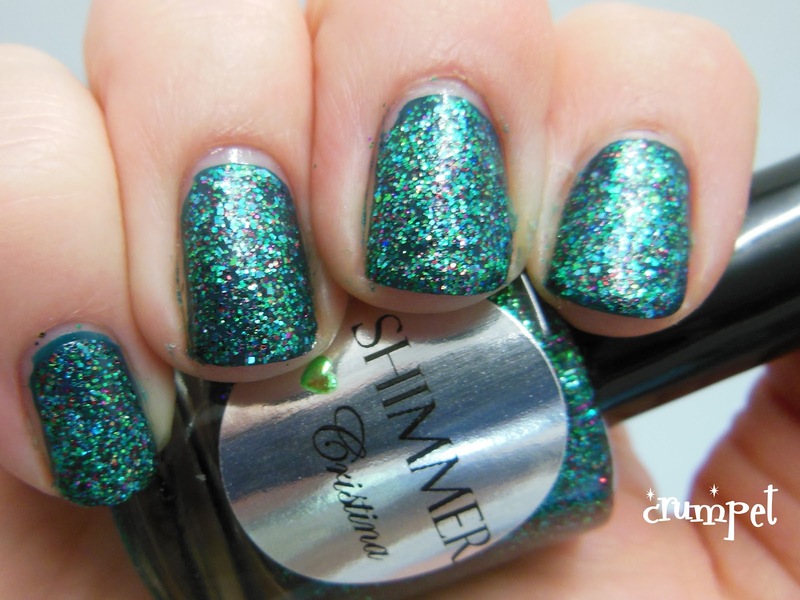 I ordered my first Shimmers a couple of weeks ago, and the lovely Cindy added in 2 extra bottles for me to review, of which this is the first. Cristina is named after one of my big polish crushes - Cris from Let Them Have Polish. It's green to match her eyes, and there's something in the crash of the colour blend that seems especially appropriate too. As you know, me and green? Meh. However, this is as close as a green can get to my heart. 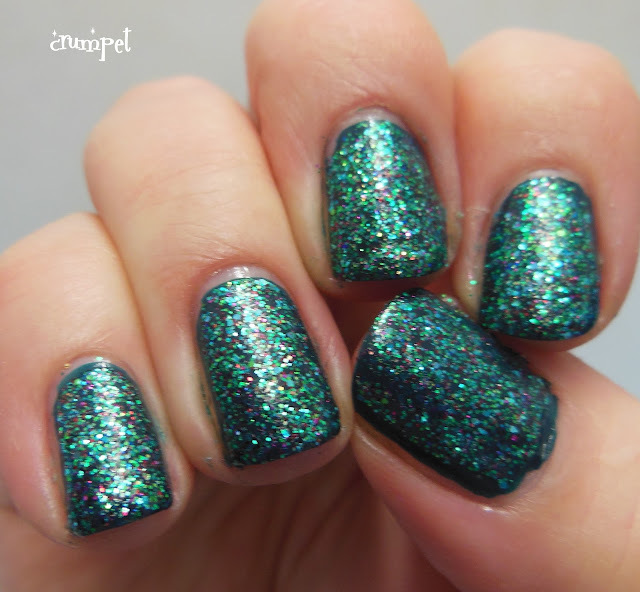 Seriously, if I was ever going to love a green polish or glitter, this is the one. Why ? 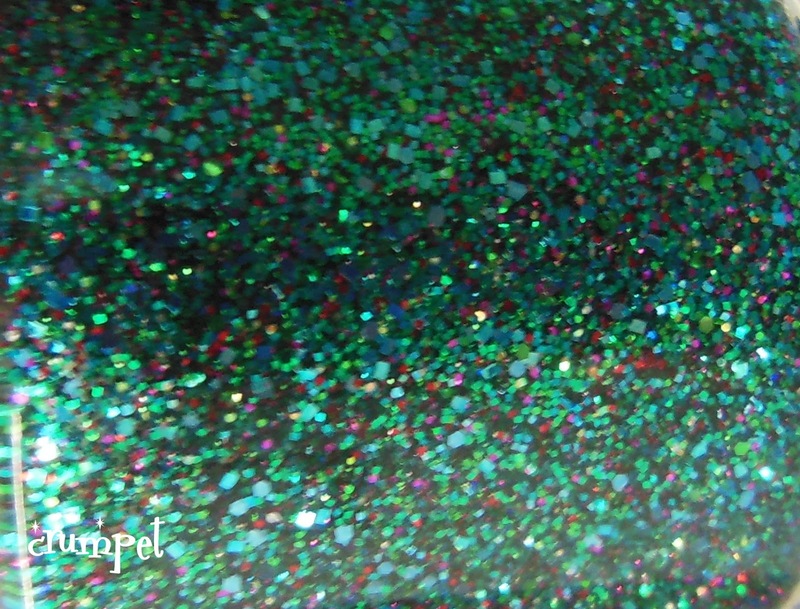 Because aside from being darkly green, this is also lavishly sprinkled with fuchsia glitter. That's right. Fuchsia. 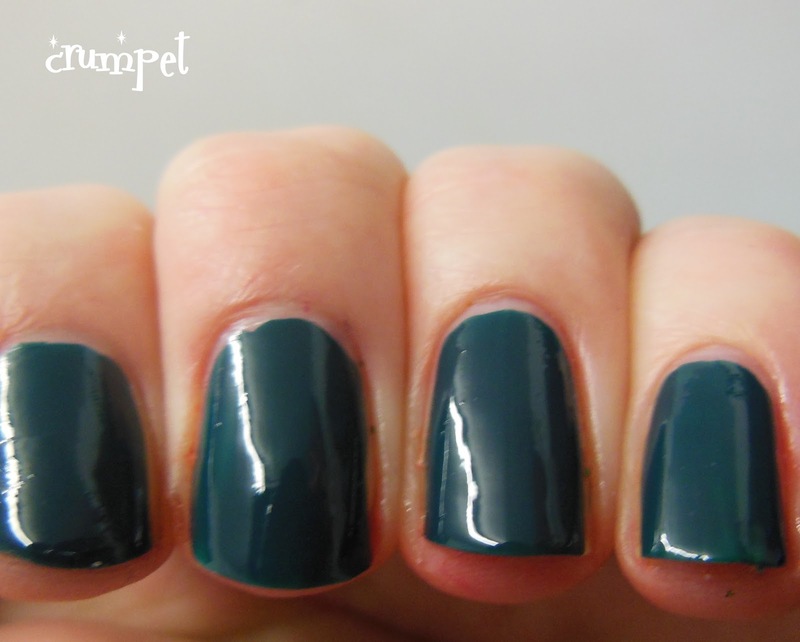 And it's this delicious clash which makes this polish so spectacular. Somehow, the fuchsia ADDS to the green, rather than subtracts, upping the ante and highlighting the frostiness where the glitter veers blue. It creates a genuine kaleidoscopic majesty. Love. Honestly.